The usually dark aspect of thoroughly silicified wood is brought about by the transparent chalcedony or quartz which lets the light penetrate into depth where it is trapped among cell walls and decay products of the wood. The presence of white spots indicates that some process had been going on which deviated from the usual way of silicification. Since the phenomenon is found in silicified wood from several locations and may be quite common, it has aroused the interest of palaeobotanists and fossil collectors, which apparently did not lead to an explanation. 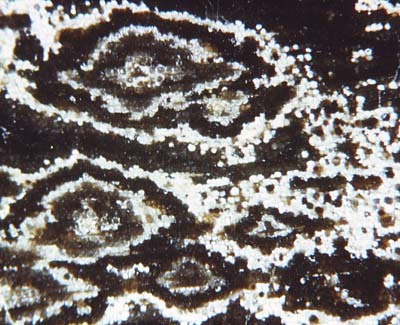 The spots are often structured (Fig.1) and occasionally shaped, sized, and arranged on the tree trunk cross-section such that the whole may resemble some poorly preserved Psaronius stem, and really had been repeatedly mistaken for such, once even by the famous B. Cotta . The aspect suggests the notion of growth beginning at a centre and proceeding with some enigmatic periodicity. (See also "Silicified wood".) The centre of growth is distinctly seen in every structured spot in Figs.2,3 as one cell cross-section bloated into circular shape. 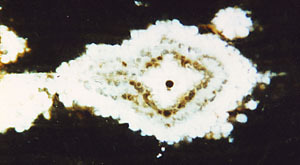 As a most peculiar fact, the central cell of the white spot can be either dark or white. Hence, one may well suspect that the explanation of the whole phenomenon must be rather complex. No explanation will be proposed here but details are described which eventually will lead the way. The straight border on the left in Fig.2 is due to a pith ray which traverses the big spot and is vaguely seen coming out of the spot on the right. The centre may consist of more than one cell, as seen in Fig.4. 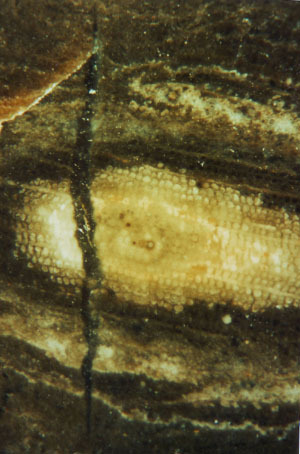 Fig.4: Fossil wood cross-section, cells with white fill partially arranged along radial tracheid files. Here, a tendency of the process to propagate along the radial cell files of the wood is obvious, in addition to the other tendency to form concentric zones. Not visible on these cross-sections but worth mentioning is the strongest tendency, which is propagation along the tracheids, so that in 3D, the spots are really slender rods. It had been proposed that these Upper Carboniferous wood specimens developed the spots much later, possibly in the Tertiary, by a similar process which bleaches flint while exposed to the sun . That idea can be refuted by several observations indicating that the spots were early formations . The short crack in Fig.5, whose gap is rather wide considering that its length does not exceed the picture frame, must have formed while the whole was still soft, a silica gel in an intermediate state of solidification. Obviously the white spot is older than the crack, hence was formed early. From the fact that the wood structure is well preserved in the spot but largely deformed and decayed in the vicinity it is evident that the spots are areas of early mineralisation which prevented decay, and that some time must have elapsed between spot formation and solidification of the whole. Fig.5: Fossil wood cross-section with a structured spot transversed by a crack indicating a gel-like consitution of the whole while the crack was formed. It can be hoped that the observed details reported here, if combined with further investigations, will lead to a satisfactory explanation of the phenomenon. provided by W.+G. Etzrodt, Borxleben. Photographs by R. Noll, Tiefenthal. Annotation 2012: Recently a beautifully patterned coniferous-type fossil wood sample has been misidentified as Tempskya by H. Kerp. See Mock Tempskya. B. Cotta: Die Dendrolithen in Bezug auf ihren inneren Bau. Leipzig und Dresden, 1832. H. Süss, P. Rangnow: Die Fossiliensammlung Heinrich Cottas im Museum für Naturkunde Berlin, Neue Museumskunde 27(1984), 17-30. H.-J. Weiss: Veröff. Mus. Naturk. Chemnitz 21(1998), 37-48.